With the “Great American Eclipse” just two days away, I thought I’d do something a little different this week and delve into the back story behind an image that hasn’t (yet) been incorporated into one of our product designs. If you’re a regular reader, you know I live in the path of totality. In fact, my town is nearly smack dab in the middle of the 70-mile wide swath which will experience complete darkness for 2 1/2 minutes on Monday at roughly 11:30am Mountain Time. Tens of thousands of people from across the United States – and around the world – are headed to eastern Idaho for the event, in no small part because the skies here are generally clear during the month of August. It being high desert, there’s not a lot of cloud production this time of year unless you’re in the shadow of the Teton Range. Ironically, though Monday’s forecast calls for the sunny day everyone expected, meteorologists are also watching some cloud cover that is expected to move through the area at mid-day. When the height of the “show” lasts for less than three minutes, a passing bank of clouds can be a very bad thing. This situation got me thinking about my challenging relationship with the moon. 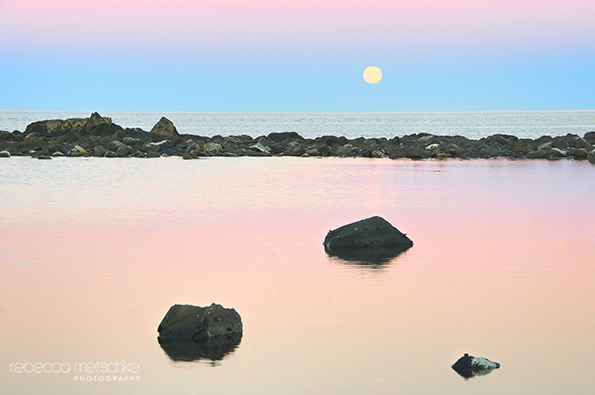 One September evening a few years back (when I still lived in New Hampshire), I decided on a whim to run over to the shore and photograph the full moon rising over the Atlantic ocean. I went to one of my favorite shoreline locations, a large tidal pool, and positioned myself so the moon was aligned with the trio of partially submerged rocks in the foreground. There were no clouds in the sky, but the twilight wedge added a lot of nice pink to the scene. The resulting image is pictured above. Three months later, I went out again on a brutally cold and windy evening to Nubble Light in York, Maine to shoot the full moon shining over the lighthouse, decorated for Christmas. Two nice moon shots in just a few months! I started thinking I should give the full moon more of my attention. Little did I know how difficult that endeavor would be. It wasn’t for lack of effort. Mother Nature simply did not see fit to provide me another opportunity to photograph the rising full moon for the next 18 months (the rest of the time I lived in the Granite State). Three Super Moons in a row: clear skies but extreme haze at the horizon. I trudged out to the ocean each time. It wasn’t obvious whether it was haze out there or not – but as moonrise came and went, and there was nothing in the sky…..
On those occasions it took more than 30 minutes before anything was visible, and by then of course it was too high in the sky. Other times, it was raining – or overcast. If it seems far-fetched when you hear a photographer talk about the fact that it took years to make a specific image, you can now understand how that can be. Here’s hoping for clear skies on Monday!